Handbooks in the Oxford University Library of Psychology are meant to cover subfields of psychology and to cover focal areas in depth and detail. 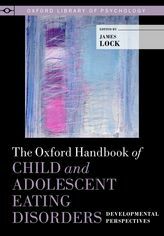 This series previously published the Oxford Handbook of Eating Disorders, edited by W. Stewart Agras. Now James Lock, Professor of Child and Adolescent Psychiatry at Stanford, has edited an excellent companion volume. For this compilation, Dr. Lock, who has contributed significant original research and scholarly writings, most notably in areas of family treatment for adolescent anorexia nervosa, has drawn on the talents of a highly accomplished international group of scientists and clinicians from the US, Canada, Great Britain, Germany, and Austria. The resulting Handbook authoritatively surveys developmental considerations in epidemiology and risk for eating disorders; assessment; interventions; and, finally, includes an excellent examination of contemporary translational issues linking brain circuitry, cognitive reward processing, and eating disorders. In each section and in many of the individual chapters, a wide range of biological, psychological, family, and social contributions are integrated from the developmental perspective, giving the book great coherence. Throughout the book the literature reviews are thorough and the accompanying scholarship is discerning. While many of the chapters are outstanding, several are particularly commendable. A chapter reviewing developmental approaches to the diagnosis and treatment of eating disorders by Julia Heumer and colleagues nicely diagrams temporal and cross-domain relationships seen in the developmental, phenomenological and treatment complexities encountered in eating disorders among children and adolescents. Similarly, Nancy Zucker and Christopher Harshaw’s chapter on emotions, attention, relationships, and developmental models of emotional self-regulation is noteworthy. Simon Gowers and Claire Bullock’s chapter on choosing treatment settings is worth careful consideration by all caregivers and families, and will be particularly useful to those who might have access to the varied types of resources described. All of the chapters are written at a high level of sophistication, and, among other topics, cover such issues as prevention, media exposure, gender issues, diagnosis, family evolution and family process in relation to eating disorders, physical symptoms and management of physically ill children, specific attention to issues of infancy, middle childhood and later adolescence and young adulthood, binge eating and bulimia nervosa in the context of obesity, and developmental psychopharmacology in relation to eating disorders treatment. 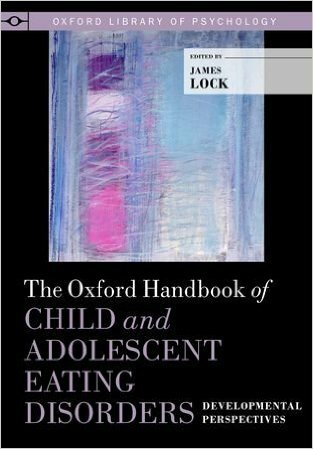 This book will serve as a very useful guide and resource for students, advanced scholars, researchers and child-adolescent mental health clinicians who deal with children and adolescents with eating disorders.